The Kingston Breakfast Run in March, organised by Human Race, was to be my first official race greater than 10 km (13.2 km to be precise). After completing my first 10 km run a fortnight earlier (Run Through Bushy Park 10 km), in preparation for my upcoming first half marathon, I immediately scoured the internet for a soon-to-be-held mid-distance run (i.e. 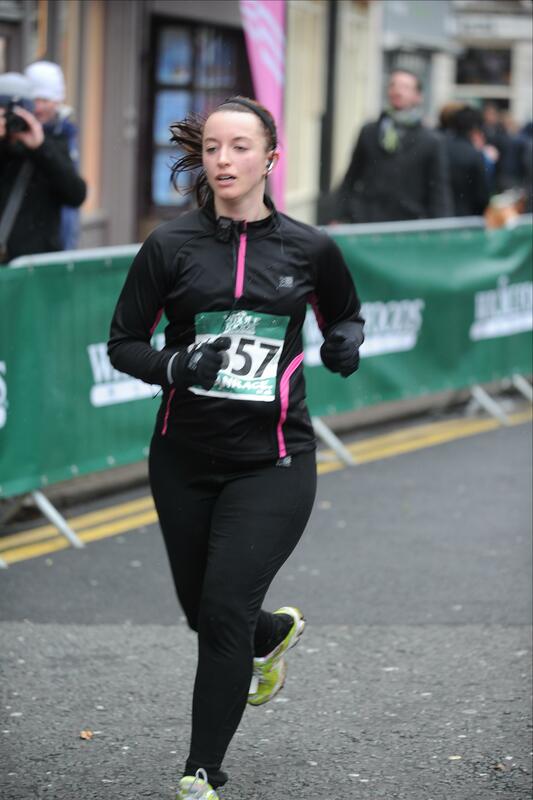 10 km – 21.1 km), partly in panic and in post-race exhilaration. This event offered the choice of either an 8.2 or 16 mile course. 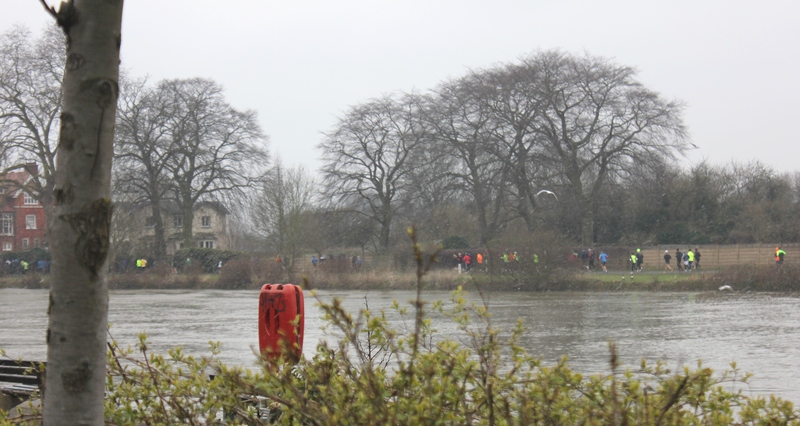 The race started in Kingston town centre with the 8.2 mile participants starting at 8 am, followed by the 16 mile participants staggered 24 – 35 minutes later in three groups. It was particularly cold weather, with the morning temperature not much more than 1°C. I was nervous at this unfamiliar distance, but knew I had to get this under my belt to feel more confident for the half marathon in Vienna the following month. 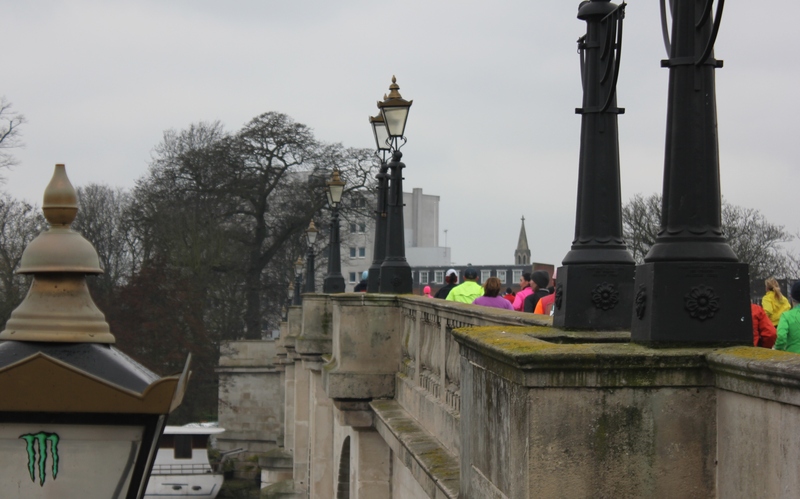 The beginning of the race took us west and immediately over Kingston Bridge where we took an immediate left turn at the foot of the bridge to run alongside the northern bank of the Thames in the direction of Hampton Court Bridge. The condition of the path was not the best, with a combination of puddles and stones on a clay-like surface. From halfway along this path I saw runners ahead already crossing the bridge and was amazed at how fast they were. Hampton Court Palace (home to King Henry VIII) was the highlight along this 3 mile stretch between the two bridges. At reaching Hampton Court Bridge the course took us left over the bridge and onto a busy A-road. I welcomed the change in scene although it was not particularly scenic. Refreshments were available at approximately 4 miles with water and PowerBar energy gels being provided. This was my first time using energy gels, after hearing much about them from Dano, and I was looking forward to seeing what effect they would have. Within minutes I felt energised and my limbs less lazy. Soon after as I settled into my pace a very fast and athletic looking male runner (a 16 mile participant) came out of nowhere and sped past the ‘normal’ paced runners. From this point onwards the 16 milers started to pass by. 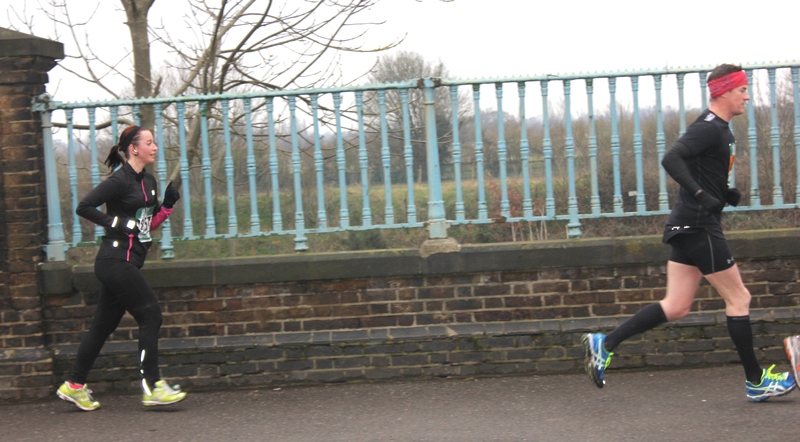 After passing through Thames Ditton the course turned onto Portsmouth Rd at approximately the 5 mile mark, taking the runners into a strong headwind. The 16.2 milers increasingly merged in with the 8.2 milers and were easy to spot. Although warmed up inside my thighs were freezing and my fingers pink so the gloves went back on. 2 miles from the finish line the road eventually aligned itself with the river and we were on the home straight. My form felt good and I was running upright. I focused on each stride and was relieved when I saw the 8 mile marker and eventually the town centre. With only 200 yards to go I knew I could afford to increase my pace and did so until I crossed the finish line. With much relief I walked achingly out of the finishing area into the sanctuary of the food and drink stalls where I collected my Whole Foods goodie bag. Next race: Vienna City half marathon.